Pasta alla Carbonara is an easy dinner that can be ready in just a few minutes, and you may already have everything you need to make it! The other night it was 6:00, and I suddenly wondered, “What’s for dinner?” Taking a quick inventory of what was on hand, I decided I could make Linguine alla Carbonara. 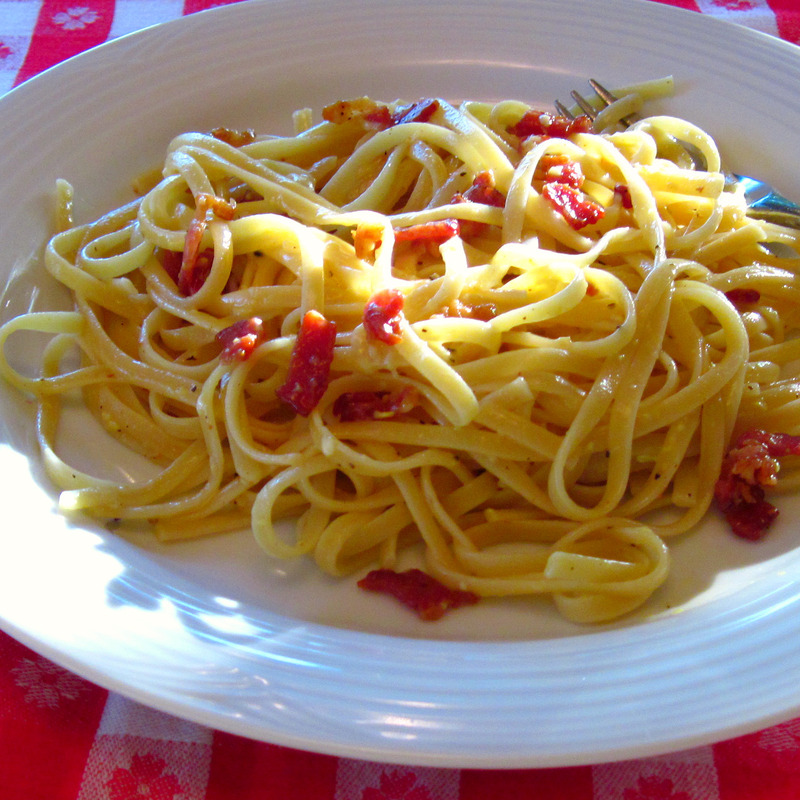 Pasta alla Carbonara is normally made with guanciale or pancetta. I had bacon, so you might call this Italian-American Pasta alla Carbonara. It may not have been authentic, but it was quite tasty. I checked out Frank Fariello’s Memorie di Angelina blog about “la carbonara” (after I had already made mine) and learned that linguine is not typically used for this dish. Linguine, he said, is from Campania and Carbonara is from Lazio; apparently, the cuisines of these two regions are quite different. Spaghetti is the pasta that is usually used; I had linguine in my pantry so that was my pasta of choice. So using what I had, I made a quick Linguine alla Carbonara for dinner. 1. Bring a large pot of water on to boil. 2. Put the oil in a large skillet; add the bacon and the garlic. Cook, stirring, over medium-low heat until the garlic is golden. Remove the garlic clove. Continue cooking the bacon until it is done, but not crisp. Take the pan off of the heat. 3. When the water is boiling, add 2 tablespoons salt and the pasta. Cook according to package directions. 4. While the pasta cooks, beat the egg in a large bowl. 5. 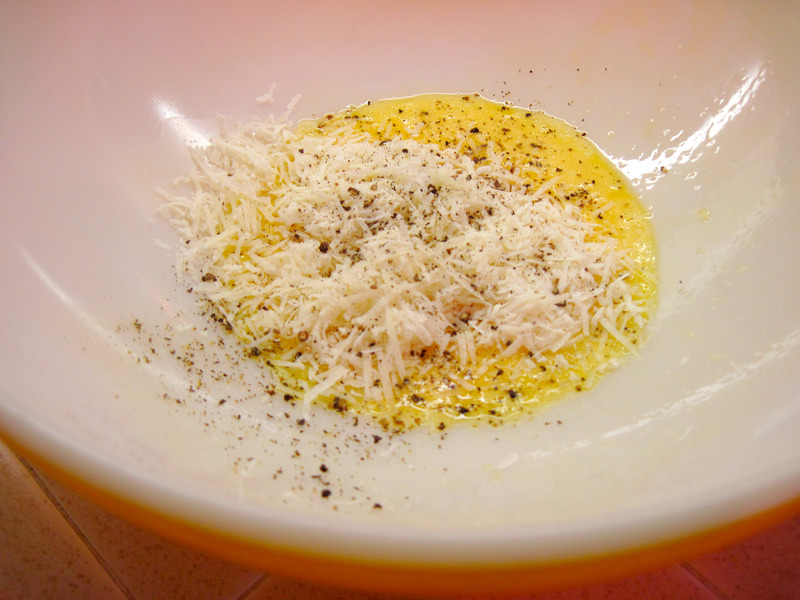 Add the cheese to the egg, and grind a generous amount of black pepper in the bowl. 6. When the pasta is done, reserve a bit of the pasta water, and then thoroughly drain the pasta. 7. Quickly toss the pasta with the egg and cheese in the bowl. The heat of the pasta will cook the egg. Continue tossing until the pasta is well coated. 8. Add the reserved bacon and drippings and toss again. (If the pasta seems a bit dry at this point, toss in a bit of the reserved pasta water.) Serve immediately with extra cheese, if desired. Your site is lovely and I really like the way you cook. You could even convince me to take a fork to this, though I’ve always been nervous about partially cooked or raw eggs. Great photo – I like how the light dances across the top of the linguine. Thanks so much for your comments, Denise! I was nervous about the egg, too, until a first tried this. I make sure that I quickly get the drained pasta into the egg so it can’t cool off and then quick toss quite vigorously. I’m convinced that the egg does cook adequately. An alternative, which I have done successfully before, is to toss the hot pasta and the egg mixture right in the skillet with the bacon. Hi, Kath. I enjoyed reading your post and learned that linguine is a no-no! 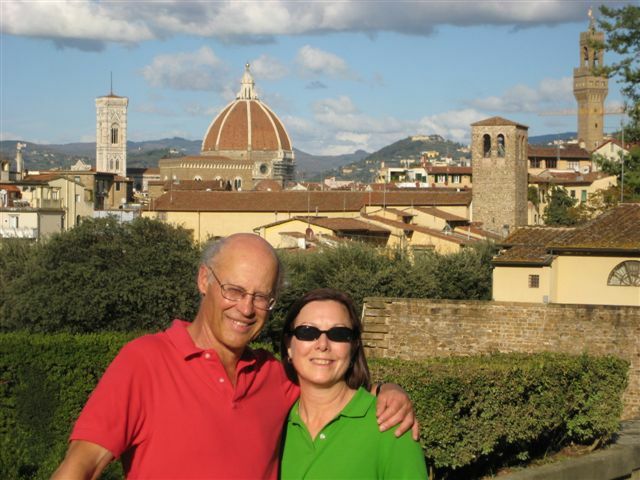 Frank is very knowledgeable about Italian cuisine, in the blogosphere. You’ve made me want to have carbonara again very soon. Thanks, Dan! I really enjoy Frank’s blog; I love the family stories and history that he shares, and his recipes are delicious! I’m very intrigued by the egg in there…will have to give this a try! now that is great pasta dish I have not had Carbonara in a long time! I don’t think the spaghetti would have made a big difference, all that lovely sauce still clung to your linguine! and bacon works just as well…. I love the bacon-garlic-egg-Romano combination of flavors. And I think you could make this with any shape pasta and it would be fantastic. Beautiful photos. Thanks, Lynne! I agree with you about the pasta. I love a traditional pasta alla carbonara. In most recipes, they add heavy cream which isn’t necessary when using the eggs! Delicious!! Cream is definitely unnecessary! I once read a comment by an Italian food lover (expert?) (I’m sorry, I don’t remember who it was) that he judges an Italian cookbook by its Pasta alla Carbonara recipe. If there’s cream in it, it’s not a book he adds to his collection. My boyfriend and I made this together the other night – it was AMAZING! We loved the recipe – it was simple to make and tasted great 🙂 We used turkey bacon as a healthy substitute, which worked well with the addtion of a little extra olive oil. Thank you, Kath!